A clandestine satellite built for the U.S. National Reconnaissance Office will launch into space today (April 10) after weeks of delay, and you can watch it live online in two places. 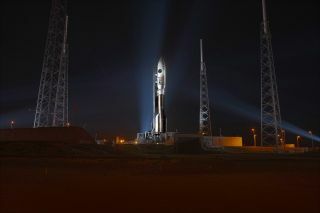 The NROL-67 satellite will lift off at 1:45 p.m. EDT (1745 GMT) from the Air Force Cape Canaveral Air Force Station in Florida, and you can track the mission live online via Spaceflight Now and Atlas 5 rocket provider United Launch Alliance. Today's launch of the NROL-67 mission has been delayed since late March after a required ground-based radar system was damaged. The mission was initially slated to launch on March 25. The radar system has since been repaired, setting the stage for today's launch. You can see a launch timeline for today's Atlas 5 flight via Spaceflight Now.